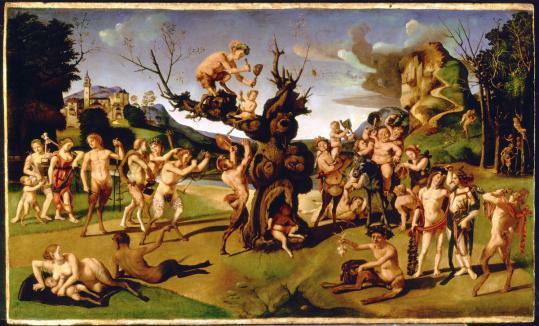 WORCESTER — Piero di Cosimo, who painted this enchanting picture, doesn’t quite fit into the parade of Renaissance greats like Botticelli, Michelangelo, Leonardo, or Raphael. This painting at the Worcester Art Museum is related to a similar, unfinished-looking work in the Harvard Art Museum, called “The Misfortunes of Silenus.’’ Both pictures, and probably some others, were painted by Piero for the Vespucci family at the very end of the 15th century and displayed in a house formerly owned by the Medici family. On either side of the central tree (it’s matched by a similar tree in the Harvard picture) we see a crowd of couples and revelers: On the right, there’s the tubby old Silenus smiling atop his donkey (he is more the center of attention in the Harvard picture), and in the foreground the handsome Bacchus with his arm around the goddess Ariadne. The story illustrates an episode in the evolution of man. It’s given a dramatic frame by two background details: on the left, a serene hilltop town, symbolizing civilization; and on the right, a higher rocky outcrop, with threatening weather, symbolizing wild and threatening nature. Clearly a lover of nature, Piero was allegedly terrified of lightning but loved heavy rains. Sebastian Smee can be reached at ssmee @globe.com.